While out doing a 6 mile walk with 1400 steps we came across the Rose City Food Cart Pod, which I had been to before, but none of my friends had. The one day I came with my family we were able to hit quite a few of the carts and get a sampling of what there was, except for Bangkok Xpress. When I showed up on this day, tired and hungry I knew I was going to give them a try. I do like Thai food and I needed something to get me back to my car which was 3 miles away at this point. My new favorite thing to order these days is Pad Se Ew. I got introduced to this by a friend a few months back and everywhere I go I love it. When I saw they had it I knew it was what I would order. Another friend was also ordering from this same food cart so we decided to also get a salad roll to share because we both love those. 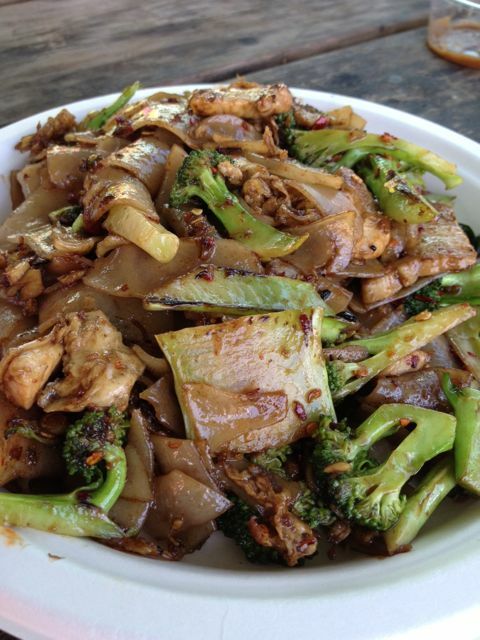 I ordered my Pad Se Ew medium spice. Apparently it was rather spicy and apparently I can tolerate much more spice that I ever thought because I loved it, yet every.single.person that sampled it said it was super spicy. So my warning to you is be careful. The serving size was huge, I mean huge. For $6 you could nearly split this and grab an appetizer. Well, I’m not a quitter so I polished off my whole dish because I wasn’t about to carry it 3 miles. 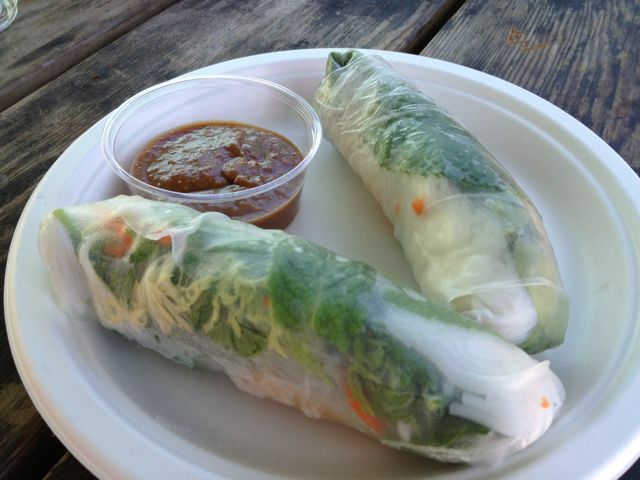 Salad rolls were very refreshing on this hot spring day and the peanut sauce was super yummy. I mean, what’s NOT to love about peanut sauce. Yum! Atmosphere at this pod is much different than most. It’s very open, feeling less cramped even with lots of people. They have a great covered area and a kids play area, plus lots of carts. Pricing is great at just $6.00 for entrees that are large. $3 for the Salad Rolls, also a great price. Service was really slow, I wish they would have warned us of the 30 minute wait. They did have Thai Iced tea, although I just had water. Bangkok Xpress is located in the Rose City Food Cart Pod.